Good Wednesday to you. Overall more nice weather is on tap for the next 36 hours or so as temperatures will be returning to more seasonable levels…it’s been a nice run since the 3rd of January or so…and we’re running more than 8° above average for the month so far. That will be about as high as that number gets for awhile…we’re coming back to reality with chillier temperatures and more wintry weather starting Friday into the weekend. With that said more 50s are coming our way next week again! Today: Sunny with some high clouds around later today. Highs closer to 40° or so. Still rather breezy as well with gusts to 25 MPH possible…maybe a bit higher at times too so it will “feel” cooler too! Friday: Some rain developing..some wintry mix…some snow. Accumulations possible at night especially. Highs in the 35-40° range. Not a pleasant afternoon especially. So yesterday in explaining the “cinnamon bun/roll” storm in the eastern Pacific…I talked/wrote about how it was going to split into pieces and there was essentially a “dance” of those pieces that would help in determining how the wintry part of the storm plays out. This still seems prudent as a way of explaining the potential for later Friday into Saturday. First the “cinnamon roll”…here is a look at the water vapor loop showing the system that now is in the process of splitting up into many pieces. The water vapor channel helps us “see” the moisture in the atmosphere a bit more clearly than some of the other “channels” available to us. For giggles…take a look at the forecast wave heights across the western US…it’s be fun to be in a safe place in the NW US near the coastline and watching the big waves crash ashore. Some 25 foot waves coming in! There is actually another whopper of a storm towards the Aleutians…that may actually be a significant player in a bigger pattern change later this month…more on that down the road. Back into the Plains states…colder air (really just typical for January air that’s cold) is building southwards…so we’re done with the 50s for the time being. 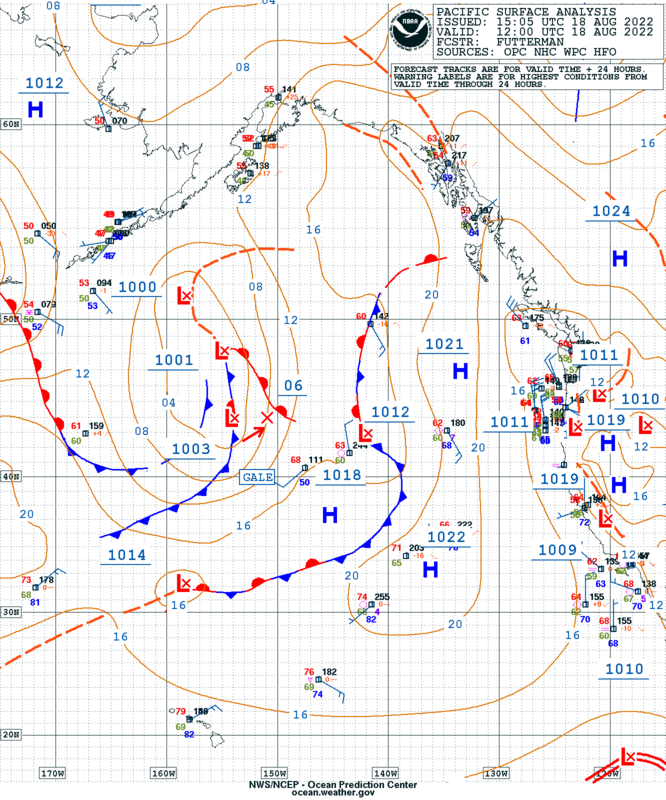 Here is the morning surface map with the region in clear NW flow at the surface. aloft the temperatures are dropping as well today compared to yesterday. Our temperatures several thousand feet above us will be running about 8°C or so colder than yesterday..that’s more than 15°F cooler so you can see how we’re back to more typical January weather today. This colder air is a 1st step in the late week storm. If it’s close to 50° it won’t do us much good for snow…closer to the 30s and we’ve got something cooking maybe. So ingredient one is there…colder air. Now as far the moisture goes..this will be a gradual process. It should be maximized the later in the day we go on Friday. So the western storm is the key to this whole thing…it’s obviously still out there and breaking up into various upper level waves. The issue is the modeling will have an impossible time with this process (not unusual) until we get some better sampling of the pieces after they break off from the “cinnamon roll”. Therein lies the rub…we know the moisture will be increasing in abundance later tomorrow into Friday. This moisture will be mostly 7,000 feet or so…and that absence of moisture above that level (where snow actually forms) is an issue into the afternoon on Friday. That means that whatever happens on Friday through lunch will be mostly liquid. One caveat…let’s watch the 32° line as the precip (perhaps scattered) develops before lunch Friday. I’m not expecting much freezing drizzle/rain from this initially but it’s worth monitoring. Temperatures on Friday will be around 35° for most of the day. Then as we start to see even more saturation develop in the afternoon…and the atmosphere gets a few degrees colder…snow should develop aloft after lunch Friday. Where our near surface temperatures are will help determine how much of the developing snow above us…actually reaches the ground. So sometime Friday afternoon a wintry mix is possible BUT withe the daytime hours…the temperatures most likely in the mid 30s…most of the falling snow should melt. At this point it appears the evening rush will be wet and not overly white…although some slush is possible IF the snow falls hard enough. Then as we lose the daytime on Friday…and we transition to Friday night…a wet snow (sloppy) will develop. This is where the pieces of this western storm really come into play. Where will these pieces track to maximize areas of falling snow. Temperatures will probably trail off into the 31-34° range after sunset Friday…so it still may take awhile to accumulate any snow. This is all very important because I won’t post any snow maps today because many of the maps out there are a strict 10:1 rain/snow ratio. This means that 1″ of rain is equivalent to 10″ of snow. It doesn’t work like that in the real world most of the times. IF the atmosphere is VERY cold the ratios can be extreme..20…30…40:1 ratios can and have occurred before. Flipping that around…you can get 5:1 ratios too when the atmosphere is border line. That would mean that 1″ of rain would equal 5″ of snow. See the difference? What I like to do at this point is just look at how much actual precipitation is being cranked out in 12 hour periods where I think the snow will be falling. Last night’s NAM model gave us about 1/3″ from 9PM>9AM SAT in terms of moisture. The GFS model gave us only about 1/10″ and the EURO model gave us about 1/4″ or so. Let’s just assume that that is snow. So by looking at that it’s about 3″ on the NAM model…1″ (barely) on the GFS model and about 2+” on the EURO. This seems like a good opening salvo…add in some slush factor too and IF the snow is lighter…like the GFS shows…we might be more into the glorified dusting category. The NAM to me just seems way too wet for a storm that is in pieces and not particularly “focused” and IF we don’t maximize the lift at the right time Friday night into SAT AM…the snow will be light to begin with. That means IF more of the lift is in the afternoon and not the night…we’re wasting accumulation potential. A look at the ensemble probabilities for the total snow through mid AM Saturday show these odds for at least 1″ of snow. Both the maps above are through 9AM Saturday. As far as the football game goes…tailgaters may still be dealing with patches of light snow in the region…with temperatures in the 30s…the falling snow may melt on the pavement though during the mid>late day Saturday. By gametime the snow may be winding down (maybe even be overwith) and the clouds will hang on through Sunday as temperatures struggle to get much above 35° both days. I’ll see you on FOX 4 tonight…we’re debuting the new set that’s been under construction for the last several months. A long time coming for sure…some different weather presentation areas will take a bit of time to get used to…so we’re going to walk before we can run. The lighting is one of the bigger changes…new equipment means we can cut the lights down significantly. It was one of the things that blew me away really…there’s more light in your living room I think than on that set in any one spot. Beautiful photo. I am going to try and dye some fiber (wool that is spun into yarn) with those colors.